Title: The Taking of Pelham One Two Three. Item: original release british quad movie poster. Size: 30x40 in (76x102 cm). Description: Walter Matthau, Robert Shaw, directed by Joseph Sargent. Original British Quad, the best poster for the movie, in very nice condition with only minimal wear. I've been in this business since 1996. When in town, please be sure to come by. I currently have over 4000 original international movie posters from all over the world in stock. Additional items can be added at NO EXTRA COST. We get very good rates, and we'll be happy to pass them on to you. There is no universal grading system in the movie poster hobby, and the different grades within a system may vary considerably by the personal standards of the person or company grading the poster. That said, the following grading terms should merely help to give you a general idea of the condition. We are using the following grading system: MINT (M) An unused, unfolded item in perfect condition, with only minimal wear if any. NEAR MINT (NM) Usually applies to folded, but otherwise mint movie posters or rolled posters with only minimal wear. Posters and lobby cards may have single pinholes in corners. VERY FINE or FINE (VF/F) A used film poster in overall excellent shape, but with minor signs of wear. May have pinholes, smaller tears, light fading and slight overall wear. VERY GOOD (VG) An average, theatre used movie poster. Several pinholes, tears, fading, tape stains, and/or minor paper loss may occur. Item will most likely show heavy fading and/or significant paper loss. May still be presentable if framed. Items in Good condition are not recommended for the condition conscious collector. FAIR/POOR Below average, major defects. Unless it is an extremely desirable title, we don't sell items in this condition. 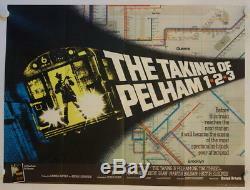 The item "The Taking of Pelham One Two Three original release british quad movie poster" is in sale since Saturday, July 16, 2016.